A preposition is an important part of the English language. It is used to show a relationship between the noun and pronoun in a sentence. A preposition must always be followed by a noun or pronoun in a sentence. It can never be followed by a verb. There are many preposition examples that will make it easy to understand how the parts of a sentence fit together and how the rules apply when it comes to using a preposition in a sentence. Simple prepositions are words like at, for, in, off, on, over, and under. These common prepositions can be used to describe a location, time or place. She drew the picture with a crayon. We located the key for the lock. I got a package from a friend. I have liked that song since 1999. She put the flowers by the window. The food was placed on the table. Double prepositions are two simple prepositions used together, often indicating direction. Some examples are into, upon, onto, out of, from within. The baby climbed onto the table. It is up to us to find the answer. The loud noise came from within the stadium. She never leaves without her phone. The bird sat atop the oak tree. I was unable to get out of the appointment. Compound prepositions (or complex prepositions) consist of two or more words, usually a simple preposition and another word, to convey location. Some examples are in addition to, on behalf of, and in the middle of. She sat across from Marie. I attended the meeting on behalf of my company. We were in the middle of the storm. He has gym class in addition to his regular classes today. He picked up the penny from beneath the couch. Aside from singing, she also plays the piano at the bar. My car is parked in front of the mailbox. The weather will be good this weekend according to Tom. Participle prepositions have endings such as -ed and -ing. Examples are words such as considering, during, concerning, provided. She is interested in anything concerning horses. He works one job during the day and another at night. The dog kept following him home. All the neighbors were there including the new one. The principal was asking questions regarding her behavior. Considering his age, he did a great job. He was frustrated at the situation. The teacher said no talking during class. Phrase prepositions (or prepositional phrases) include a preposition, an object, and the object's modifier. Examples include phrases like on time, at home, before class, and on the floor. I will get to the conference on time. The baseball game was canceled after the heavy rain. John found his homework under the bed. The children loved the gifts from their grandparents. He succeeded with a little help. We met to discuss the project before class. She left muddy footprints on the clean floor. According to his wishes, his funeral will be private. Prepositions are words that show relationships. A sentence would not make sense without the use of a preposition. There are different types of prepositions used in the English language that not only add detail but make a sentence complete. Prepositions are used to show location, time, direction, cause and possession. "Preposition Examples." YourDictionary, n.d. Web. 23 April 2019. 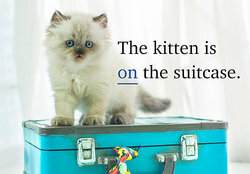 <https://examples.yourdictionary.com/preposition-examples.html>. A preposition is an important part of the English language. It is used to show a relationship between the noun and pronoun in a sentence. A preposition must always be followed by a noun or pronoun in a sentence. It can never be followed by a verb.There are many preposition examples that will make it easy to understand how the parts of a sentence fit together and how the rules apply when it comes to using a preposition in a sentence.